JASPER - Abbey Sissom poured in a game-high 26 points and collected three steals and 10 different players scored as Cannon County stormed to a 79-26 win at Marion County Friday (Nov. 18). The Lionettes (2-0) were never tested as they notched their second straight road win to open the season. Sissom's 26 led what was a balanced attack with three players in double figures and five with eight or more. Madison Walkup and Madison Simons came off the bench with 11 each. Lindsey Reed had another solid all-around game with eight points, six steals, four rebounds and four assists. Joanna Young finished with eight points, four steals and three rebounds. Rebekah Faulkner tallied five points and six rebounds. Jordan Hollis may not have put up the biggest offensive numbers but her defensive intensity and hustle plays helped fuel the Cannon County attack. She finished with four points, two assists and three steals and also had several deflections that proved disruptive to the Marion County offense. Emily Pemberton, Erin McReynolds and Ariana Kailiponi also got into the scoring column for the explosive Lionettes. "We came out with a lot of intensity and the right mentality after a long bus ride and that's important because you don't know how they are going to react early," Lionettes Head Coach Michael Dodgen said. "I am glad we took this team on the road early and played in two different types of environments. They responded well." The Lionettes jumped out to a 17-8 lead in the first quarter but took the game over with a decisive 23-8 advantage in the second quarter. Cannon County lead 40-16 at the half. Cannon County's offense never let up in the second half but the most impressive aspect of the win was the Lionettes' defensive intensity throughout. Regardless of which five were on the floor, or the score, Cannon County's defense was smothering. Marion County scored just four third quarter points and 10 the entire second half. Cannon County forced an eye-popping 40 turnovers. 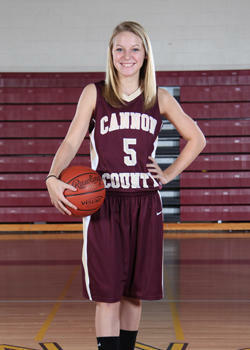 "We take pride in our defense," Cannon County senior Lindsey Reed said. "Our defense generates a lot of scoring opportunities for us and that was evident tonight. We had a lot of chances in transition because of our defense." Cannon County shot 50 percent (16-of-32) in the second half as everyone was able to see action. When Dodgen went to the bench exclusively midway through the third quarter and for the entire fourth the Lionettes continued to extend their lead and play solid defense. "The girls who came off of the bench gave a great spark and I was really proud of that," Dodgen said. "The team showed me a lot of focus tonight. At the half I told them I wanted to see how this team would react to being up big. How would they respond? They came out in the third quarter and played really well. We still are missing too many easy shots but that will come."